Have you ever asked yourself the following questions? Where will I be in a few years? What is God’s purpose for me, and where is my life headed? I have asked myself those very questions over and over in my heart. And for years, I have had no answers. I know God waited for just the right time to share with me what my life was going to look like. I know if I had the answers when I wanted them, I would have run far away and never looked back. I would have been mad, afraid, resentful, and sad. I can’t begin to express how upset I would have been. But, our God is a patient and loving Father. Fifteen years ago my momma was diagnosed with cancers of every kind. The woman I had known, who embraced life and loved having fun, was now bed ridden and could barely walk or sit up in bed. I desperately wanted to turn back the hands of time to another time in our lives where she was energetic and full of life. Yet, I was still asking those very questions again and again. She passed away 13 years ago this August. It wasn’t until 2009 (9 years after Momma died) that I started to see God’s plan for me. I attended the Motherless Daughters 12 week class. In the class, God was whispering my name to minister to other women who had lost their mothers as well. He was slowly beginning to answer my questions. 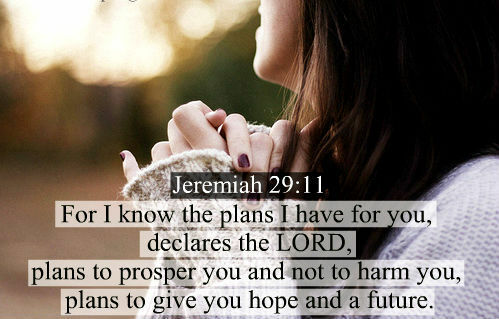 He revealed a verse that I have always loved and treasured, Jeremiah 29:11. He was beginning to show me my purpose in life; His plan for me. I was so happy I had found my purpose, but not so happy I lost my Momma to fulfill it. I found myself hurt, alone, and devastated knowing that my purpose was centered in the woman I had loved so dearly and who was now gone. God is so faithful. It wasn’t until years of shedding tears and anger that He gently spoke to me again that I was only looking at part of the verse. He showed me the last sentence of His word. God said He never meant to harm me but to give me a hope and a future. My future was to help others and their journey for years to come. To be honest, I still ache and mourn for my beautiful Momma. But my answers are now laid out before me. Where will I be in many years? I am part of The Motherless Daughters Ministry, which has been a blessing in so many ways. What is God’s purpose for me? It’s to assist other motherless daughters grieve the loss of their mother. Where is my life headed? I may not know the answer to that question, but I do know my God will show me in His due time, not mine. I trust He knows what is best for me and directs me toward this path. My question for you is…do you know God’s plan will give you purpose and not harm? Be patient my dear sisters. He will tell you in His time, not ours.